So I haven’t posted in awhile. I wish I could say it’s because of mothering duties, community service, or church obligations. Heck, I wish I could say it’s because of housework. But none of these worthy causes were (are) important enough to pull me from away from my keyboard and out of your ear. Then what, you might ask, would? 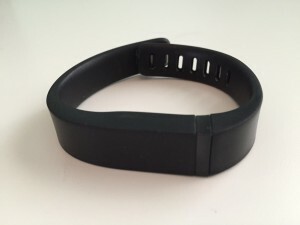 a) I’ve worn a fitbit before (the little clasp on your waistband) and eventually lost interest in it. b) This one would ruin my outfit. c) This one would ruin my outfit. Besides these three (ish) reasons, I’ve also always prided myself on being something of a free-spirited exerciser. Who wants to taint the euphoria of a good run with some all-knowing, all-seeing gadget counting your every step? I run to clear my head, not pack it with more minutiae about what I did, didn’t, or should do. You get me. But that all changed two weeks ago when the Hub presented me with this ugly little black bracelet. And before you call him a pig, you should know that he only gave it to me because he’d bought it for himself and then lost it. After weeks of looking, he bought a replacement and then naturally found the original soon after. So he asked me if I’d like to keep it. Really, he didn’t call me fat. (I don’t think.) (Wait.) (Did he?) At any rate, I figured, what the heck? With the big 4-0 loong behind me, it’s not like wearing this gizmo would be the the determining factor in spoiling my looks. So I clasped it on, downloaded the app, and unwittingly said goodbye to my old life forever. I was immediately sucked into something called the Workweek Hustle, a “friendly” weekly step competition among friends who, by week’s end, would morph into the worst kind of frenemies. In fact, frenemies became too generous a term; these people were ruthless. One in particular. With a fitbit, friends become frenemies. At best. This particular competitor, who shall remain nameless, runs his own design business from home. (He’s uber-talented, I’ll give him that.) To avoid the sedentary lifestyle that comes with sitting at a computer all day, he purchased a treadmill, took off the top handrail, and replaced it with a hand-crafted computer desk thingamajig. Consequently, this evil genius can now walk at a slow and steady pace for the full eight hours of his weekday while working; as long as he keeps his pace steady, the walking doesn’t interrupt his professional productivity. His system is inventive, impressive, commendable even. But it is hell for his fitbit competitors. No matter how active one is in the early morning, late evening, or midday, one simply cannot outstep a person who’s walked steadily for eight to nine hours a day. It’s just not feasible. And this guy knew it. Day after day, the rest of us watched the “dashboard” with bitterness as this man-turned-power-walker’s steps increased with each passing minute. No matter how many steps we took outside, we were helpless to defeat him in our pathetically treadmill-less world. He insisted that he was doing some of his running outdoors (we verified this with his wife—the honest one of the two—and in fact he was) but that offered little solace. For every mile he ran outside he would walk five on his BigFancyTailorMadeTreadmill. All we mortals could do was rage against the machine. And yet despite his gross advantage, two weeks ago I almost had him beat. For five days, I’d walked and ran and ran and walked until the spider veins on my calf had spun an actual web, culminating my effort with a ten-mile run at eight o’clock on Friday night. I was exhausted but cautiously optimistic; according to the dashboard, I had pulled into a slight lead. Everything depended on what would happen in the next four hours. I was completely spent, so all I could hope was that he wouldn’t pull any last minute step shenanigans. I sat down (oh, the pleasure of sitting!) I panted. I waited. At ten o’clock—just two hours before the tallies were due and the contest closed—the phone rang. It was my nemesis, calling—I thought—to concede. “Wow Jen, what did you just run? I can’t believe you pulled ahead so late…” His voice was soft, and so raggedly sincere, I almost felt bad for him. So in my signature blue-personalitied-middle-child fashion, I immediately tried to make him feel better. I praised his persistence, his endurance, even his (freaking stupid) treadmill. Okay. Perhaps, in hindsight, my tone was a little condescending; I may as well have reached through the phone and patted him on the head. But hey—I’d won! What was the point of beating Treadmill Man if you couldn’t take a victory lap over the cellular? I hung up the phone, opened my laptop, and sunk into a well-deserved Netflix coma. I fell asleep quickly and woke with a smile on my face. It was over. I had won! I packed up my daughter and left, at 5 am, for a volleyball tournament an hour away. At seven my husband called me. “Um, what?” Who had won what? I had no idea what he was talking about. Had an election transpired overnight in which I’d forgotten to vote? “Well, you know the contest goes til midnight. He must have went for a long run after you went to bed.” I grabbed the steering wheel for support as my stomach folded in half. This couldn’t be happening, not after all I’d put my spider veins through. As my husband went on, it all became clear: this “friend” had called to offer a fake forfeit (he swears to this day that he made no such offer; to that I say whatev.) He then used the last two hours of eligibility to lie to deceive cheat beat me. He’d been so nice—humble, even—on the phone. How could I have been so gullible? Beneath this image on my little screen a caption screamed, “Ian crushes it, and the crowd goes wild!” You can imagine how I felt, reading that text all alone in my cold car with my cold heart on that dark and dreary March morning. Oh, I felt it keenly, friends! The agony of defeat. Which is why, in the crux of that terrible moment, I made a decision. I decided that following week, I had to—and I mean had to—win. No, “win” is too limited a phrase. I had to beat him. I had…to beat…IAN! I would do whatever it took. I would walk early, I would run late. I would turn off my bluetooth while I ran (competitors can’t see your step totals if you’re not synced), then turn it on just in time for him to witness my triumphant tallies. I would scheme, I would plot, I would pray. (But I wouldn’t fast. I drew the line at fasting.) Never in my life had I wanted to win anything as much as I wanted to win that gloriously golden (if not exactly real) trophy. So come Monday morning, the race was on. And with it, my Crazy. Next Article Fit to the bitter end: Part Two.